From the Ferris Wheel at Vollmars Park, to the riots that closed Sandy Beach, this documentary reveals the rise and fall of the many area amusement parks. 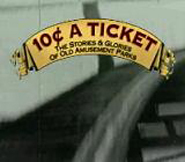 Revealing heightening emotions of falling in love and excitement, juxtaposed against the fast and curious decline of these parks, 10¢ A Ticket: The Stories & Glories of Old Amusement Parks, presents a history that all viewers are bound to enjoy. Young and old alike will enjoy the sights and thrills.